That is one looong fry. I know it isn’t technically limited to the Northwoods, but I will always associate Old Chicago with Duluth, Minnesota, because that’s where I always seem to get it. With a huge beer selection that includes my perennial favorite, Leinenkugel’s Honeyweiss, Old Chicago also has a decent food menu. 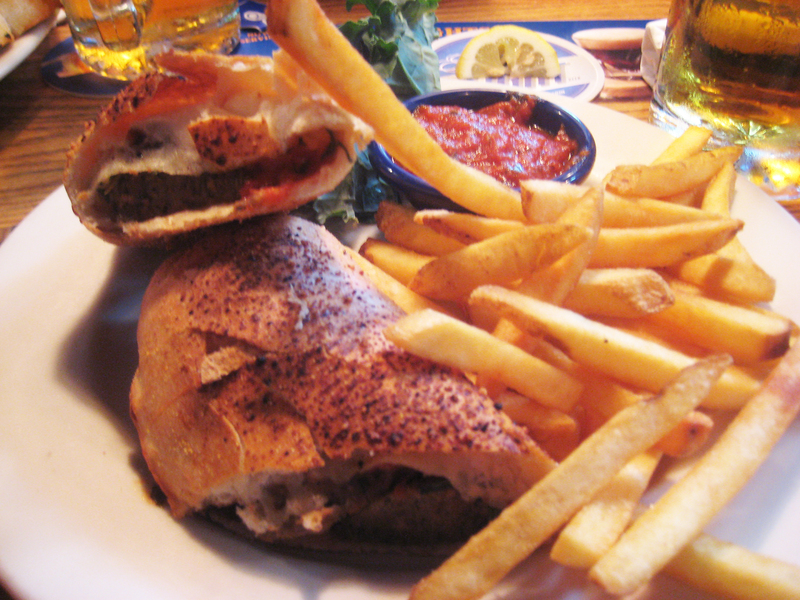 Looking it over for a while, I eventually decided on the Meatball Stromboli, mostly due to its lack of vegetables. Sipping on my beer, I relaxed as I awaited my Italian sandwich. When it came, it looked quite good. The bread was of an interesting consistency and the insides were pretty good. It came with extra marinara sauce for dipping, but this was pretty unnecessary for the packed sandwich which was already hard enough to eat without insides falling out. In all, the sandwich was good fare to go along with my beer, but nothing spectacular.